This purchase includes 25 Notes of beautifully engraved One Dollar Movie Prop Paper Money from the Ellis Mercantile Company . These $1.00 denomination notes in mint condition! All are fully printed notes. They are a series of 1935. They have printed on the front: "This note is not valid. It is for use in motion pictures only and is non-negotiable. It's use for any other purpose will be in violation of the law" and "Motion Picture Use Only" printed on the back of them. These are more sought after than most prop money notes due to the fact that there is green and black printing on them for the realistic look. Some prop money notes are single color and the production cost is less. Considering that we have hear that ONE of these notes have sold for as much as $20,(you do the math) this is an incredible opportunity for the right person, whether a collector or retailer. 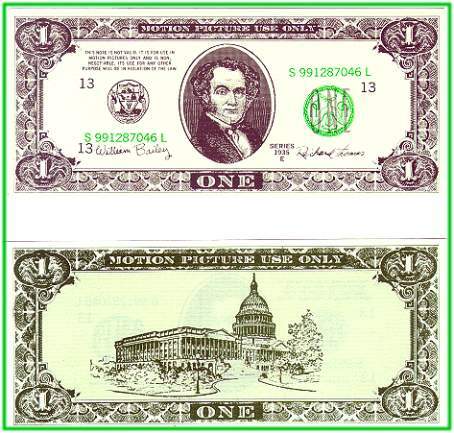 Obviously from the printing on these bills, they are from the motion picture prop industry, but buyer will also get an copy of Certificate of Authenticity issued from Ellis Props and Graphics signed by their CEO and also their Curator. Ellis was the oldest and largest prop supplier in Hollywood before closing their doors earlier this year. This is a very unique item that combines old paper money with Hollywood Movies. 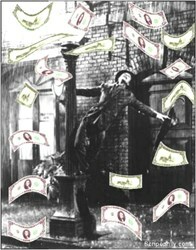 You will be Singing in the Rain With this Prop Money Package! This note is prop money that was made for movies and used by major studios for Motion Picture and TV Productions. These notes were acquired from Ellis Props & Graphics who was the oldest (since 1908) and largest prop supply house in Hollywood until closing their doors last year. If you have ever been involved in Movie or TV Production in Los Angeles, it is almost certain you�ve had dealings with Ellis Props and Graphics Partners, or Ellis Mercantile as most old-timers call it. Ellis Mercantile was established as a pawn shop in 1908. When a customer needing a glass eye for one of the earliest movie productions suggested that he rent the glass eye instead of purchasing it, the rental business was started. Over the years, Ellis props have been used on countless famous movies and well-known TV productions. Ben-Hur, Cleopatra, Spartacus, The Titanic, Get Smart and Wild Wild West to name but a few. Ellis, owned by the Tapestry Group, last year closed shop, due to failing profits combined with runaway production concerns. Over five days in early June 2000, nearly a century worth of movie props were auctioned off at the Universal Hilton and via the Internet. Everything from Ellis� 40,000 square feet of props went on the block. Attendees could bid on antiques and collectibles such as an operating Gatling gun from circa 1872, used in Clint Eastwood�s The Outlaw Josey Wales, life preservers from The Titanic, the baby carriage from De Palma�s The Untouchables, light sabers from Star Wars, the umbrella phone from Get Smart, as well as movie used real prop money which we acquired.